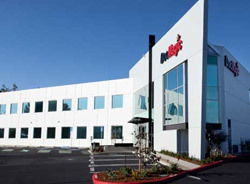 Multi-million-dollar investment gives leading mortgage document provider AIA Honors Award-winning* facility while delivering the strongest security protocols in the financial services industry. TORRANCE, Calif.—January 22, 2013—DocMagic, Inc., the leading provider of fully-compliant loan document preparation and delivery solutions for the mortgage industry, announced today that its new multi-million dollar, twenty-five thousand sq.ft., state-of-the-art technology center in Torrance, Calif. is fully operational. The new center is built on blade server architecture to deliver greater processing power and storage capacity, at will, in a much smaller footprint. 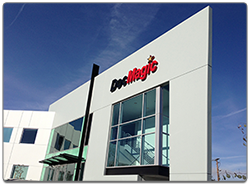 The servers are expandable, allowing DocMagic to add capacity very quickly and easily, when required. There are no limitations to the number of new customers, document orders and compliance audits DocMagic can produce, delivering fully-compliant disclosures and loan document closing packages within an unheard-of two seconds. High performance servers, high-speed networking, optimized storage access, and server virtualization are combined into an integrated, smart infrastructure allowing unlimited scalability and agility to meet the demands of our customers.